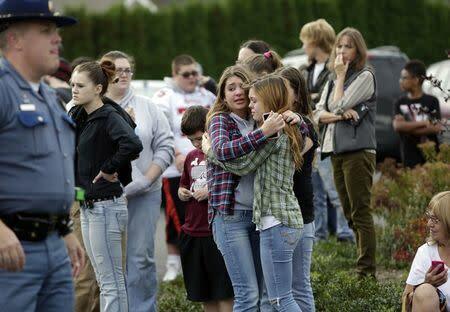 MARYSVILLE Wash. (Reuters) - A student fatally shot one classmate and wounded four others when he opened fire in the cafeteria of his Washington state high school on Friday, following a fight with fellow students, authorities said. 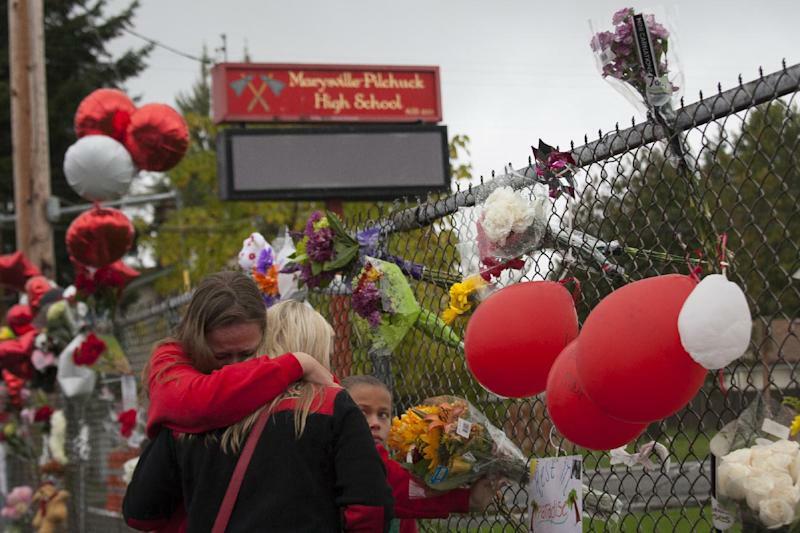 The shooter took his own life as Marysville-Pilchuck High School students scrambled to safety in the latest outburst of deadly violence at an American school. A school district official, who declined to be named because the shooter was not officially identified yet, said he was Jaylen Fryberg, a Native American student at the school. The official said the shooting followed a fight at the school. There was little on Fryberg's social media accounts to offer any insight into the shooting, although in February he posted a message on Facebook saying: "If you ask me, hunting is the BEST sport there is." Witnesses described the assailant as a well-liked freshman and member of the school's wrestling and football teams. All of the victims of the shooting were young people, and three of the wounded were in critical condition with gunshot wounds to the head, said Joanne Roberts, chief of medicine at Providence Regional Medical Center in Everett. The fourth wounded victim suffered less serious injuries in the gunfire and had been transferred to Harborview Medical Center in Seattle. A spokeswoman for that hospital said he was in serious condition. Two of the wounded were boys and two girls, hospital officials said. "At this point, we are confirming that there are two deceased,” Marysville Police Commander Robb Lamoureux told reporters in the town, about 30 miles (50 km) north of Seattle. 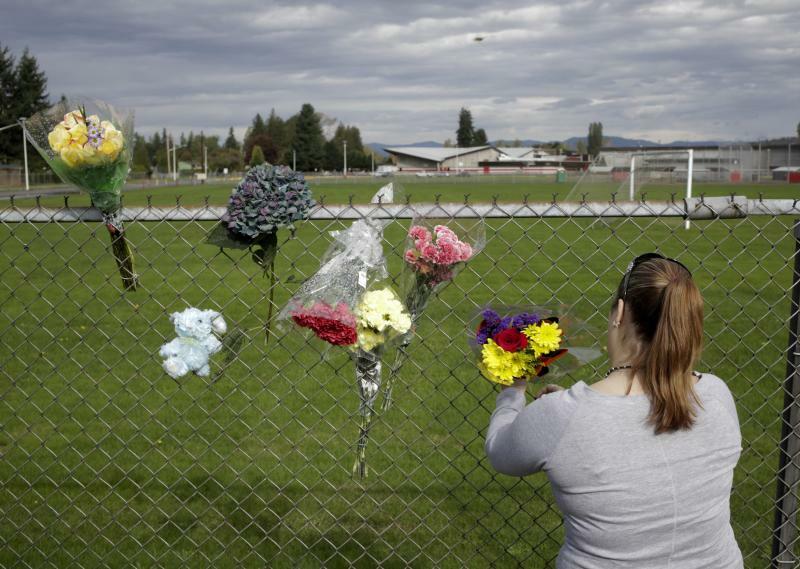 The violence at Marysville-Pilchuck High School marked the latest in a series of deadly rampages at American schools that have played a central role in a national debate over gun laws. In 2012, a 20-year-old gunman entered Sandy Hook Elementary School in Newtown, Connecticut, and killed 20 children and six adults before taking his own life in one of the deadliest mass shootings in U.S. history. Police would not say what kind of weapon Fryberg, who died of a self-inflicted gunshot wound, had used, and they declined to discuss his motive. "He came up from behind and had a gun in his hand and he fired about eight bullets into backs of them. They were his friends so it wasn't just random," student Jordan Luton told CNN, adding that the gunman fired several more shots. "Then he turned and looked at me and my girlfriend ... and kind of gave us a smirk and turned around and then shot more bullets outside," Luton said. Local television stations showed images of students running from buildings and crossing a sports field with their hands in the air as officers with rifles ran across the school yard. They were taken to a nearby church by bus. At the church, 15-year-old 10th-grader Gladis Jimenez said she heard two loud pops during her fifth period class and then saw classmates frantically running. "I heard these two big noises, and I see kids running and they looked so scared. Then the fire alarm went off and we thought it was a fire," Jimenez told Reuters. "We lined up to go (to) the auditorium and then they said no, go back and we were just running and running back and forth."